Headed by the Factory Manager the Administration Department is the heart of Nuvista Pharma Limited. Security, welfare activities and the management of staff are only a few of the Administration Department’s responsibilities. Quality Operation Department is very important for a pharmaceutical industry to maintain GMP. The concept of total quality management and total quality control refers to the process of striving to produce a perfect product by a series of measures requiring an organized effort by the entire company to prevent or eliminate errors at every stage in production. Although the responsibility for assuring product quality belongs principally to QOD, it involves many departments and disciplines within the company. To be effective it must be supported by a team effort. The QOD is vital for a pharmaceutical industry since it controls and assures for quality of the products starting from the raw materials to the finished product till the customers consume it. All kinds of necessary steps are taken by this department to serve a quality product to the end users. o Hardness Tester, Model: B 24, Western Germany. o Friability Tester, Model: T A Fed. Rep. Germany. In addition to day to day production also matter day to day. It concerns original design and development product distribution, dispensing upto the administration to the patients Nuvista Pharma Limited gives priority to produce quality product. They believe that only quantity product can satisfy the consumer and a satisfied customer is a great advertiser for the company. For this reason they have taken a stick and inflexible process to check the product for erosion of any kind of defects. For Quality control Nuvista procures Quality raw Materials from their approved source. Recording of the Quantities of collect sample by analyst on batch packaging record sheet. Allocation of the Laboratory Ref. No. to the sampling advice sheet. Preparing of the report after checking. Further checking by the officer. Releasing of the batch to the market by the QC Manager, if satisfactory result comes. Keeping of the document under supervision of QA after releasing a batch. Incase of rejection, rejected label (s) will be pasted on the product. Recording of the rejection details in the rejection register and authorized by QA Manager. Quality control is that part of GMP which is concerned with sampling specification and testing and with organization documentation and release procedures which ensures that the necessary and relevant tests are infact carried out and that materials are not released for sale or supply untill this quality has been judged to be satisfactory. 1. Receiving of the samples to be tested from QA department. 2. Issuing release, reject or quarantine advice for each batch of raw material and final product. 4. 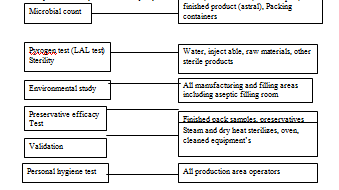 Performing all tests procedure for all incoming samples according to the schedule. Person(s) who perform the test. 6. Performing environmental monitoring tests. 7. Calibrations and standardization of laboratory equipment’s. 8. Ensuring precision and accuracy of all testing methods. 9. Control of all laboratory reagents. 10. Research & development of any new method & its validation. 11. Testing of any return goods. Lab Facility: Lab facility of Nuvista Pharma Limited is so excellent. Their lab can be described in the following way. 2. When raw materials are sent by the source in terms of invoice Q.C. department collects the sample on the basis invoice & labeled an under test sticker. 3. If it meets all E.P., U.S.P., B.P. specification then a passed sticker is labeled. 5. Q.C department also tests the packaging materials & inspects its printing name corresponding to the product. 6. Q.C department tries to recover tests the quality after final packaging. 7. If any finished product is damaged during transfer to CWH Q.C department try to recover the product as a return goods. 10. The Q.C department tests water that is used for manufacturing process as it meets its specification.  Loss on drying or moisture or water content. 1. Appearance of dry granules. 2. pH of prepare syrup. 6. Inspection of test syrup. 7. Appearances of prepare syrup. Carton Appearance, weight, moisture content. • Reduces batch testing at the end. • Reduces the chance of batch failure. The quality control department of Nuvista Pharma Limited also performs stability testing for both the marketed product and the development products. Production area is the major section of pharmaceutical industry where men, machine and material are brought together to yield a product of quality. In other words, it is the heart of any pharmaceutical industry. Our training programme would be incomplete without visiting production area. We saw that the production area of Renata Limited to be well organized and running smoothly. The personnel of this area were very cooperative and well trained. We would like to express our gratitude to Mr. Md Mizanur Rahman, Production Officer (Solid section) and Mr. Md. Mozammel Haque, Senior Production Officer (Parenteral section). We would like to thank Mr. Sajibul Islam, Mr. Masud, Mr. Tarique, and other officers of this area. The Production area is meanly classified into two major areas. Manesty BB3B 27-Stations Tabletting Mach. Requisition is given to warehouse for raw materials prior to granulation. Raw materials are collected from warehouse through air lock and transferred to a clean dispensing room. Dispensing condition (Temp, RH %) should be maintained. For these reasons, drugs must first be pretreated either alone or in combination with filler to form granules that lend themselves to tableting. This process is known as granulation. Granulation is any process of size enlargement whereby small particles are gathered together into larger, permanent aggregates to render then into free flowing state similar to that of dry sand. On the other hand, granulation is in part of the pharmaceutical process that attempts to improve the flow of powdered materials by forming sphere like or regularly shaped aggregates called granules. Time, space and equipment required are costly. Compression is the process of applying pressure to a material. In pharmaceutical tableting an appropriate volume of granules in a die cavity is compressed between an upper and lower punch to consolidate the material into a single solid matrix, which is subsequently ejected from the die cavity as an intact tablet. Feed frame: Fed by the hopper to hold the granule as it is fed in to the die. Feed paddles: Ensures that the granule is keep agitated to correct filling of the die bore. Draw-down Cam: The lower punch guide during the first part of the fill stage, adjustable to ensure that the die bore is over filled initially to allow accurate adjustment at weight control. Weight control: The lower punch guide during the latter part of the fill stage, adjustable to ensure that as the punch rises, the correct quantity of granule remains within the die, and therefore the tablet dosage is correct. Fill Station: The point where the die has been correctly filled. Pre-compression rollers: This smaller roller gives the granule an initial pinch to remove as much air as possible before full compression takes place. Main compression rollers: Applies full pre-determined pressure to the punches for the final formation of the tablet. Compression Station: Where full compression of the tablet is achieved. Ejection cam: This forms the lower punch guide during the ejection stage and is adjustable to ensure smooth ejection without damaging tablets. Take-off blade: Fitted in front of the feed frame this deflects the tablet down the take-off chute. Ejection station: This is the station where the tablet leaves the die for take-off. i) Capping It is due air-entrapment in the granular material. 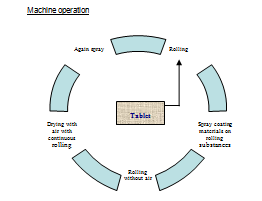 ii) Lamination: It is due air-entrapment in the granular material. Capping is the partial or complete separation of top or bottom layer of the tablets from the main body of the tablet. Chipping is the breaking of the edge of tablet during compression. A certain percentage of moisture is often essential for good compaction. But excess moisture causes softening of granules and causes shipping problem. Due to the lack of lubricants to the granules, the edge of granules may be broken down during compression. Addition of sufficient amount of lubricant. Chipping problem may arise due to the rough surface of the upper punch. -The surface of the punch is polished by using lubricant. Serious sticking of the granules with the die wall during ejection causes chipping. 1 Die wall is surrounded by tungsten carbide. 2 Inverting the die wall. 1 Improper setting of feed frame. 2 Incorrect adjustment of sweep off blade. 3 Improper setting of ejection knob. 1 Proper setting of feed frame. 2 Proper adjustment of sweep off blade. 3. Proper setting of ejection knob. Lamination is the separation of a tablet into two or more distinct layers. ‘Picking’ is the term used when a small amount of material from a tablet is sticking to and being removed off from the tablet-surface by a punch face.The problem is more prevalent on the upper punch faces than on the lower ones. The problem worsens, if tablets are repeatedly manufactured in this station of tooling because of the more and more material getting added to the already stuck material on the punch face. ‘Sticking’ refers to the tablet material adhering to the die wall.Filming is a slow form of sticking and is largely due to excess moisture in the granulation. Small, fine cracks observed on the upper and lower central surface of tablets, or very rarely on the sidewall are referred to as ‘Cracks’. ‘Mottling’ is the term used to describe an unequal distribution of colour on a tablet, with light or dark spots standing out in an otherwise uniform surface. Double Impression’ involves only those punches, which have a monogram or other engraving on them. If the letters on the tablet are impressed twice, then they are known as double impression. ‘Binding’ in the die, is the term used when the tablets adhere, seize or tear in the die. A film is formed in the die and ejection of tablet is hindered. With excessive binding, the tablet sides are cracked and it may crumble apart. a. Unequal size distribution of granules. b. Poor flow property of granules. b. The space between the upper and lower punches at the moment of compression. Adjusting the amount of binder. 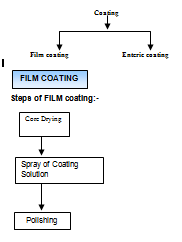 Inadequate adhesion of the film coating surface characteristics of the products being coated (e.g. hydrophobic substrate). Insufficient plasticizer in film/ high internal stress. Logo disappearance can be due to erosion of tablet surface around logo. Reduce erosion potential by either reformulating core. Changing logo design or modifying curvature of faces of tablet. Reduce spray drying potential by increasing spray rate. Spray guns too close to tablet bed. Increasing atomizing air pressure /volume. Capsule is a solid dosage form, in which medicaments are enclosed in a capsule shell, made from gelatin. Generally we use empty hard gelatin shell. Capsules shells are made of two parts-body and cap. Medicaments in the form of powders or granules, are filled into the body and locked with cap-the form of dosage form is called capsule. Charge develops on pellets surface on frequent agitation and they stick to each other hampering the flow rate. By using talc, mg stearate the following problem can be resolve. Injections are sterile and pyrogen free products that intended to be administrated in the body with the help of syringe or needles through various route such as IV, IM etc. As the products directly go to the circulation, they must be free from any microbial contamination, toxic compound that should process & exceptionally high level of purity. Room temperature: 20ºC ± 2ºC. Air velocity of laminar flow: Horizontal 84+20 ft/min, Vertical 56+10 ft/min. Air change not less than 20 per hour. Fumigation of the room: this is done with 2.5% savlon in DM water. UV irradiation for whole night. Rubber closure, container, membrane filter, SS vat, filling machine. Equipment, empty ampoules, vials, bottles etc. In NUVISTA PHARMA water used in liquid division mean purified water, drinking water, normal water, distilled water, WFI (water for injection) all are supplied by sterile division. Water filtrated by 0.2μ filter. In some cases specially water wastage in washing section in sterile division are reused by filtration and pass through IR. Drinking water also supply in the head office through container. Fig: Water Treatment Plant Flow Chart of Nuvista pharma Ltd.
Laminar Air Flow Unit, Franz Ziel, Germany. Packaging is the process by which the pharmaceutical products are suitable paked, in such way that they should retain their therapeutic effectiveness from the time of their packaging to consume by the consumers & it also helps to withstand the stress during transport. Nuvista Pharma Limited has a well-established packaging department. Plug area create pocket by plugging (Alu-Alu), In case of Alu-PVC forming create pocket with the help of air pressure & temp (130º-160 ºC). Tablets are manually arranged into production trey. Top holders contain Aluminium foil. Sealing temperature 150 ºC to 210 ºC. Scoring is done by slitter. In case of alu-alu, no heat is required. Whereas in alu-PVC 80 ºC to 100 ºC temperature is required. Waste coiler coil the wastage remaining after cutting. Drawer draws the blistering materials to the cutting area. PVC Color, width, thickness, weight per unit area etc. Shipping carton Weight, diameter, thickness. Dropper Appearance, length, weight and plastic cover. Tape (adhesive) Appearance, width, Adhesiveness. Bottles, Ampoules Height, volume, capacity, diameter, machine acceptance etc. Leak test is done by the leak test machine after completing blistering and stripping. Blister / strip are kept under the pored vehicle in the container which contains purified water. Air pressure is given by switching on. Maximum 760 mmHg pressure can be given. But usually 400mmHg is given in case of big pocket and 600mmHg is given in small pocket. When the primary packaging is completed then the tablet or capsule containing blister or strips are checked. And finally the strips or blisters are made ready for secondary packaging. A fixed number of tablets or capsules are packed into each strip or blister. And a fixed number of strips or blisters are packed into each packet. The packets are then poured into the box. Quality Operation Department is very important for a pharmaceutical industry to maintain GMP. The concept of total quality management and total quality control refers to the process of striving to produce a perfect product by a series of measures requiring an organized effort by the entire company to prevent or eliminate errors at every stage in production. Although the responsibility for assuring product quality belongs principally to QOD, it involves many departments and disciplines within the company. To be effective it must be supported by a team effort. The QOD is vital for a pharmaceutical industry since it controls and assures for quality of the products starting from the raw materials to the finished product till the customers consume it. All kinds of necessary steps are taken by this department to serve a quality product to the end users. Hardness Tester, Model: B 24, Western Germany. Friability Tester, Model: T A Fed. Rep. Germany. The engineering department is responsible for regular maintenance of the plant, machines, services and sanitation to help achieve smooth production and safe environment. • Installation of production equipment. • Maintenance of the building. • Maintenance of the fire alarming system. • Validation of laboratory equipment’s. • Calibration of laboratory equipment’s. 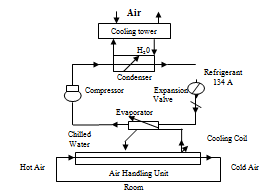 • Maintenance of heating, ventilation and air conditioning system (HVAC). • Maintenance and supply purified water for treatment. • Well controlled of drainage system. • Supply of electricity of its own arrangement. • Maintenance of effluent water treatment plant. Nuvista Pharma Limited has a well-equipped engineering department. It is divide into three sections. Civil: All Construction works (any new construction and repairing) is done under this section. Electrical: Daily electric supply to the industry is the main job of this section arises to the supply of electricity, and then this section takes emergency measurements. Mechanical: This section does Installation and validation of production machinery and their machinery’s. The following services are also under the control of mechanical section. 4. Compressed air. 5. Water supply. Ware House is the large area where all the raw materials, packaging materials and the finished products are stored. From the Ware House the raw materials are sent to the production unit. Again the finished products are stored in the Ware House. Warehousing is normally the largest in terms of area special attention is paid which is focused on maintaining cleanliness freedom form infestation and order orderliness. v Storage for Raw material. v Storage for Packing material. v Storage for Finished product. v Storage for Thermolabile product (Foster/cold storage). 1. Quarantine area: After receiving, raw materials and packaging materials are kept here for QA approval. Area is located in the front portion of the building. 2. Released area: Approved raw materials and packaging materials are generally stored in the central place of the warehouse with great safety. 3. Rejected area: Rejected raw materials, packaging materials, finished products are stored here with great care. The rejected area is located at corner portion of the warehouse in a separate room, where entry is strictly regulated. 4. Finished Products area: Finished products are stored here for delivery. 5. Special area: It includes cold room, freeze room for poisonous materials, room for flammable materials. ü Physical inspection & receipt/discrepancy report. ü Leveling in the container. ü QA release/ rejected materials. ü Dispensing of released/ rejected materials. Sometime maintain LIFO (last in first out) in case of raw material. Tallying the quantity with delivery challan against ½ hour after receiving purchase order / L / C & preparing G.R.N. the challan. Shelving passed materials at respective shelves quickly transferring of the packing materials store from quarantine. Tallying the goods mentioned in quickly after receive finished goods transfer note goods transfer note. As the process of taking a small portion from a lot for test and analysis to show the quality of the whole lot. The purpose of sampling and subsequent testing is to provide an effective check on the quality of the product or substances being processed. Sampling quantity should be the double of one complete test. A batch or number of batches in a consignment. A campaign means number of batches manufactured without any interruption or product change. The term handling means checking according to invoice/challan and other documents during receiving of the materials. The term preservation means the materials are stored in different conditions according to its nature of stability i.e. to maintain a specific temperature and relative humidity. Dispensing means the materials are supplied to the production areas by weighing according to the proper document and release it from the RM Store. Quarantine The term quarantine means the material is not ready for use and it is under test after received. So a quarantine label is attached to the container. FIFO The term FIFO stands for First In First Out. Re-test The term re-test means the samples are needed to be repeated analysis for identify vs. previous documentation and it has been done either 3/6/12 months. Highly sophisticated HVAC system and AHU are used to condition, monitor and supply clean air to the working zone. All modern, effective and necessary equipments required for granulation are available. Efficient and experienced production officers. Quality is maintained by Quality Compliance unit. Productivity may be increased by proper utilization of granulation machinery. Neat and clean working area. 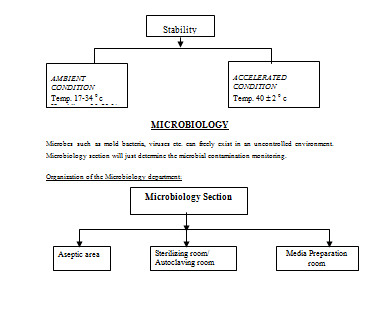 Particle and organisms are strictly controlled specially in sterile area. Clean room class is maintained each and every area of sterile section. Quality Assurance Department is really proper oriented. Space for the quality control section is really inadequate. It needs to be expanded urgently in order to keep up the quality of the product. Man is the best creation of God. He gained this rank and position by dint of education. Education makes a man a perfect human being. Education aware him of his duty to the family, to the society and there by to the nation. Having had the pharmaceutical education, we now realize that we shall be able to tender our services to man kind to some extent. The objective of the industrial training was the partial fulfillment of courses and for achievement of practical experience about manufacturing of quality drugs. We are fortunate enough to be gainer of the opportunity to receive training from a company like ‘Nuvista Pharma limited’. We would like to express our sincere gratitude to ‘Nuvista Pharma limited’ for their constant professional guidance, conceptual teaching and proper training. v Commitment to the highest quality products. v Stringent quality control procedures. v Raw materials from the best source. v Highest quality packaging materials. v World class formulation technology. v Diversified and sophisticated dosage forms. In conclusion, I hope that, Nuvista Pharma Ltd. has succeeded to achieve all the objectives of its establishment and continue its success in future by taking all necessary steps which should be required for its growth.